Carbon dioxide scrubbers like those that clean the air in space stations. Industrial parts used in wastewater treatment. Michael Maher’s job was to assemble the pieces into one of the most sophisticated ocean acidification simulation systems yet developed. Ocean acidification is the decrease in ocean pH due to its absorption of carbon dioxide from the atmosphere – carbon dioxide forms an acid when it dissolves in water. 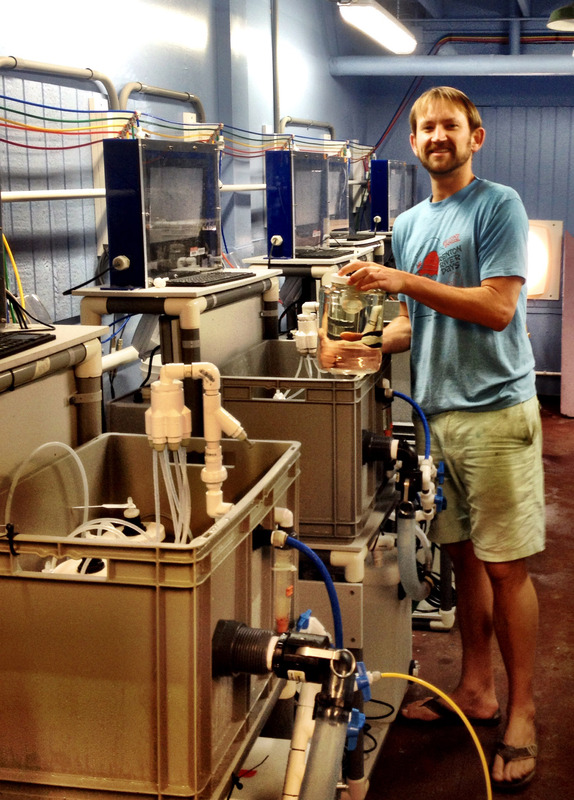 The system that Maher and the ocean acidification research team built in the Science Center’s parking lot has provided new insight into the impacts of future ocean conditions on marine species. Researchers used it to examine what happens to small marine snails from Puget Sound when exposed to both current ocean conditions and the acidified conditions expected in the future. The research is described in a new paper in the online journal PLOS ONE reporting that current West Coast ocean waters are acidified enough to dissolve the shells of the snails, called pteropods. The finding is not a surprise: Another NOAA-led team reported in April that shells of pteropods in near-shore habitat on the West Coast show signs of dissolution due to acidified waters. What is important about the new research is that it measured the extent of shell damage at escalating carbon dioxide concentrations, each translating to a different degree of acidification, in a controlled laboratory environment said Shallin Busch, a NOAA research ecologist. The findings are a first step toward using the pteropod species examined in the study as a living barometer or indicator of ocean acidification along the West Coast. Pteropods provide important nutrition for whales, seabirds and fish such as herring, salmon and mackerel, so changes in their populations could rattle through the marine food chain. Carbon emissions during the industrial era have lowered the average global ocean pH from 8.2 to 8.1, turning oceans slightly more acidic. West Coast waters are naturally acidified compared to other parts of the ocean so they may affect marine life such as pteropods sooner than acidifying waters elsewhere in the world. The research also demonstrated the capacity of the NWFSC’s ocean acidification system to hold marine life at different carbon dioxide concentrations for extended periods. The system can control temperatures, oxygen levels and light for even more precise management of conditions during experiments. The comprehensive controls allow researchers to isolate acidification as the cause of the shell damage, ruling out other factors that might otherwise be at play in a natural environment. Busch said each member of the research team – Maher, McElhany and NOAA Hollings Scholar Patricia Thibodeau – brought individual skills to the research. The team has also developed a smaller and transportable version called a Mobile Ocean Acidification Treatment System, or MOATS that could be carried in the field or aboard research ships. 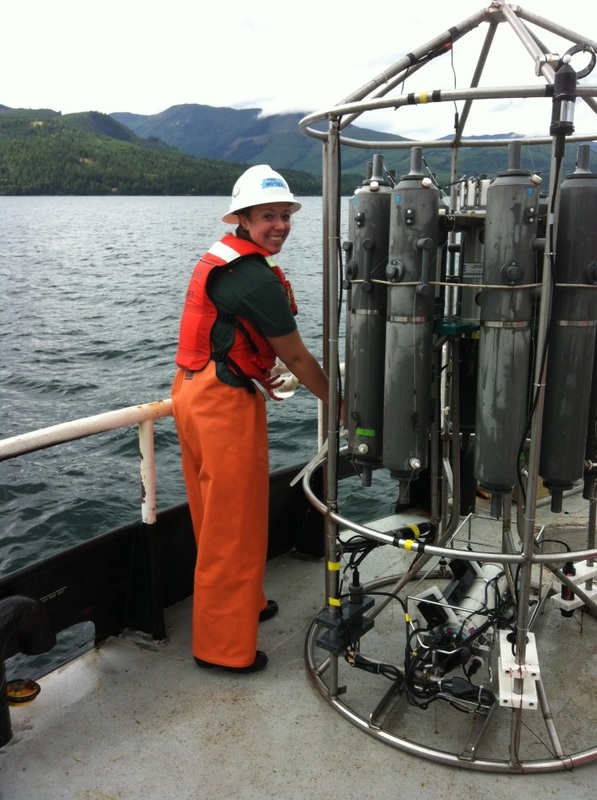 Thibodeau joined the research team for the summer of 2012 after her junior year at Bowdoin College in Maine. One of her initial tasks was to collect pteropods from Puget Sound by boat at night to stock the experimental system. Pteropods ascend in the water column at night to feed. The vertical movement naturally exposes them to varying carbon dioxide concentrations, which the ocean acidification system can simulate. Later Thibodeau helped examine the shells of pteropods exposed to different concentrations of carbon dioxide. As with most science experiments where objectivity is paramount, she did not know which ones had been exposed to which concentrations when she rated the extent of damage to each shell.